My son and I had an experience dreamed about for years. The trip was so well planned for and the guides were excellant. They answered all questions and were always looking out for our interests. We ate so well and had great fellow rafters. The sights were the best you can have of the canyon. 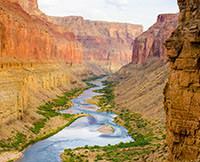 If you visted the rims you have to go on this kind of trip to really expereince "The Canyon".